I know I know, bad joke! But was thinking about years back and how lots of fishermen’s stages had a smoker on the side of them. I don’t recall any ever in use, but Roy’s stage back in Apsey Brook had one, and was often a good spot to hide when playing hide and seek. It was just a tin lined “chimney” with nails sticking out going up the sides. 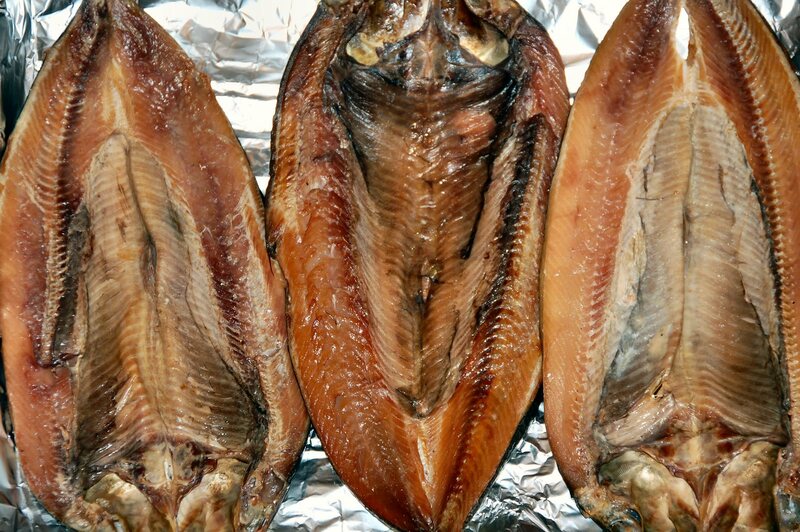 Roy, and of course whoever else used them would hang caplin or herring up in them, light a fire at the bottom, generally with alder wood, and smoke them to make… well smoked caplin and kippers! I love the taste of smoked fish of all varieties, and when we got a little older, Eric and I bought a little electric smoker between us. Had a little element in the bottom with a small pan, and we’d add wood chips and let them smolder to smoke our own kippers, and lots of other things, but mostly trout and our own moose and beef jerky! We could buy all kinds of chips, and of course get our own alder, and sometimes apple and others. We’d experiment with making different brines to add different flavours (hmmm did I ever tell the story of “Who put the salt in the punch?”) and smoke lots of different things, including trying cheese on one or two occasions. Junior Patey used to love trouting, but he was never really find of the trout, so he’d freeze a lot for his family, but one day he tried the smoked ones Eric and I made, and he loved them, and whats not to love? Its like fish bacon! Anyway, over the next few weeks he emptied his freezer of trout and smoked them all! I know Eric still smokes stuff now, and I do too, tho for me its smoking bought stuff as there’s not many trouting holes here in the city (plus I have no idea if half these weird fish up here are fit to eat anyway, I liked that we had trout and only trout back home). Eric sent me up some jerky he made last year, and I think it lasted all of 20 minutes, cause I was sparing it along! Anyway, keep yer fish lit, and have a smoky ole day! Yeah, Junior sure did love the smoked trout! And yeah i still like to smoke stuff, only fish and meat of course lol. Hmmm, I wonder who would do a thing like putting salt in the punch? Haha priceless! I thought I wrote about that punch story before, but not sure, will have to look and see. If not definitely worthy of a post! This was such a lovely story. I do really enjoy your posts. Thanks!